Spyder® Black Euro Headlights for your 2009-2012 Dodge Ram 1500 gas model features bolt-on headlight assemblies, a black housing with clear lens and amber reflectors. The clear lens and multi-faceted reflector will provide brilliant illumination for safer driving at night and the custom headlight housing will give your ride an exclusive and unique look. High quality lens and multi-faceted reflector for sparkling and consistent illumination that increases safety of all road users. Creative light and reflector layout allow for a truly custom appearance that will let you have the edge over other vehicles on the road. 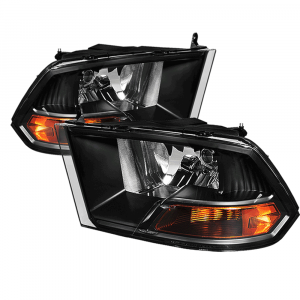 Created to be a perfect replacement for your OE lights, they install the same way as factory units. Thoroughly tested to deliver smooth operation and completely sealed to prevent moisture from being trapped inside the housing. Meets ISO 9000 and 9002 quality standards. Approved by the SAE. Meets DOT regulations and compliant with FMVSS 108.